Usually, with my blog posts, I try to give as much detail about the wedding and tidbits of info surrounding it, but sometimes you have to switch things up and share what truly inspires you. In this case, it is the bride, Anna Grant. When Anna and Logan (Ms. Debbie AKA momma, Lauren and the gals) first walked through the doors at The Barn I had no idea what an impact this lovely couple and family would have on my life. Anna is a UNCW alumni and Logan is in the Navy. During the planning phase of the wedding, they relocated to Virginia Beach for his job but decided to keep the wedding in the Wilmington area. We only met twice during the year so I didn’t get to spend as much face to face time with them as I wanted. Fast forward to the big day–They were married on September 1, 2018, which was approximately 2 weeks prior to Hurricane Florence making landfall in our area. 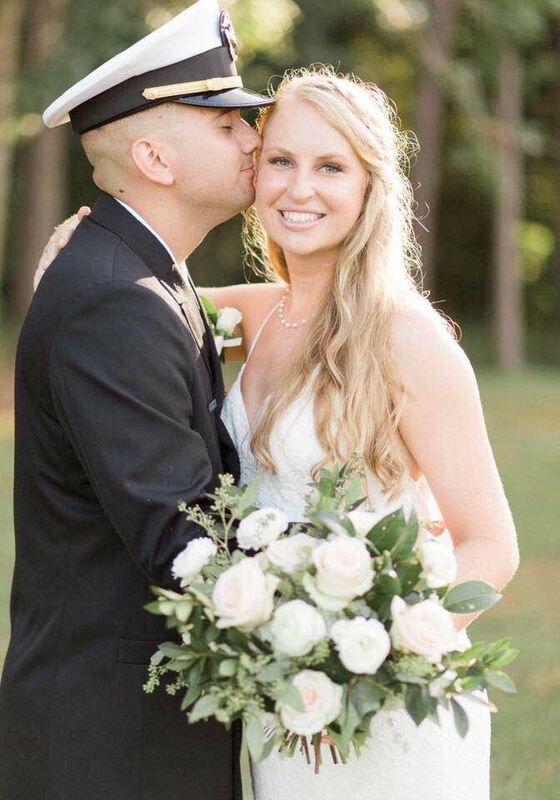 Anna and Logan requested that on their wedding day instead of gifts they would rather their guests bring donations for Vigilant Hope, an organization that they hold dear. Wait, WHAT? I thought to myself- this was the most amazing thing I’ve ever heard. That night as I packed their gifts (donations to others) I teared up thinking these people are MY PEOPLE! Little did any of us know at the time what was about to come our way…. In the wake of the storm, Hurricane Florence, I get a call and a text. Anna reached out to check on me and my family. She was in town with her mother and they were working with Vigilant Hope to help families that had been affected by the storm. I mentioned to her that I was planning a Relief Benefit at The Barn at the end of October and since then she has been in contact with me daily and assisting me in any way she can. She is volunteering her time for the event and has been working tirelessly to get donations for the cause. The realization that this young woman was brought into my life for a reason and being able to see how truly special she is brought me to tears. I want to take a moment to congratulate Anna and Logan on getting married and to let her know how amazing she is and how much I value her. Her dedication to helping people in need is appreciated beyond what I can express and I feel blessed to be able to call her a friend. I know that Logan chose you and cherishes you because of the amazing woman that you are. You, my dear are a special lady and we wish you and Logan many years of happiness and LOVE! Below is a link to Vigilant Hope a charity that is so dear to this sweet couple’s heart. Please check them out. Also check out our Blog Post about The Hurricane Florence Benefit at The Barn.